Duct tape is so popular that there’s an annual festival dedicated to the tool. The equator could be wrapped 12.3 times with the amount of duct tape sold per year! So it’s not surprising that it’s used for any purpose under the sun, even if it seems crazy. Duct tape can be found in almost every house. Some people use it regularly while others keep it in case of an emergency. Bright Side is surprised by all the possible ways duct tape can be used and we can’t wait to show you what we’ve found! 2. No more cracks in the sidewalk! 3. Spare wheel? What’s that? 10. Thanks to duct tape, this table won’t lie on your knees. 11. It can also help keep the plane’s windows in place. 12. Even the plane’s ceiling panels! 13. The duct tape shirt is a must-have. 14. The road is still clearly visible. 18. 1 old table is better than 2 new ones. 20. And there’s no need to go to a repair shop. 25. It’s definitely better than glue. 27. Even birds need duct tape! 30. Duct tape won’t leave you without a faucet. 33. This tool could bind anything together. 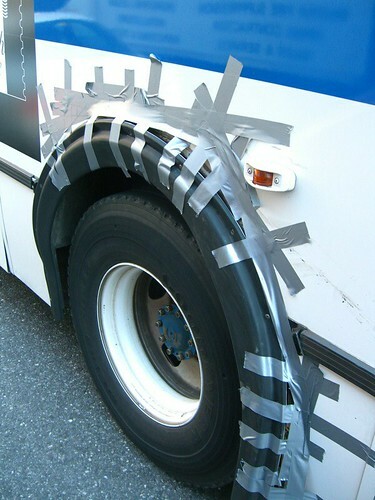 How do you use duct tape? Are you ready to try some of the above methods? Write us in the comments.